How to properly cut the “+” shape on the soil bag? Cut a “+” shape with each cut length around 4-5 cm, our experience shows that it is best grow with cut length no longer than 5 cm. Leave the cutting as it is. Do not attempt to bend or remove the plastic sheet/ plastic bag as it is meant to protect the soil bag from moisture lost. What kind of mushroom does the Moku-Moku Box grows? Where can I purchase your mushroom box? Currently Moku-Moku box can be purchased only from our website i.e. www.mokumoku.my. However we are working on getting them to be available on shelves in stores nationwide. What do you have in the Moku-moku box? It contains a soil bag, mushroom mycelium, and a free water sprayer located at the top of the Moku-Moku box. What are the white spots covering in the soil bag? Those are the roots of the mushroom, a.k.a Mycelium. It shows that your mushroom box is healthy and ready to grow! What do the grey oyster mushrooms taste like? It has juicy and meaty taste. Some say it taste like seafood! What are the nutrition value of oyster mushrooms? Oyster mushroom has high level of protein, low in saturated fat and cholesterol. Thiamin, Vitamin B6, Iron, Magnesium, Calcium, Dietary Fiber, and lots of other minerals and nutrients in it. Oyster mushroom is also known to provide Vitamin D that helps to strengthen bones and teeth. Are the mushrooms pesticides free? Yes, the soil bag and fertilisers are made out of natural and organic materials. No pesticides, or insecticides are used. 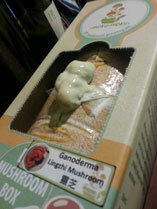 You can be sure that the mushrooms grown from Moku-Moku box are pesticides free. How is your mushroom box more sustainable? The soil bag is made out of wood sawdust, which is a by-product during the process in saw mill. We recycle and used it as the main nutrients for mushroom growing. When you finished growing mushrooms, the nutrient depleted soil bag in Moku-Moku box can be used it as organic fertiliser for your home garden! Is it easy to grow mushroom? Yes, it is easy to grow! The mushroom will grow as fast as in 4 days with sufficient moisture and a lot of love. How long can I store the kit before I start growing it? 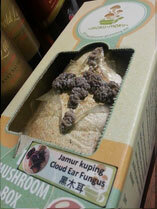 We recommend you to grow your mushroom within 2 weeks upon receiving Moku-Moku box. However cases shown that it can keep up to 2 months in dry and dark places. Where is the best place to grow the Moku-moku? You can grow Moku-moku box at any places indoor without direct sunlight. What will happen if I forgot to water the mushroom for a few days? The soil bag in Moku-moku box might completely dried out and couldn’t grow any mushroom out of it. (**by Increase the frequency of watering daily you might be able to revive it.) We recommend that you water it everyday to avoid early retirement of your Moku-moku box. How do I know when to harvest the mushrooms? You can start harvest it when the largest 2-3 mushrooms cap are around 3cm-6cm in diameters. Harvest it before it starts to get old and dry. Why my mushrooms doesn’t look the as nice as yours on the website? It is fun to grow Oyster mushroom as it always grow in different shapes and sizes, it can be TOTALLY different from what you are anticipating. Post your mushroom photos at our facebook fanpage and share with us your mushroom growing experience. Our facebook fanpage is www.fb.com/moku.my. How do I harvest the mushrooms? Hold the whole batch of mushroom deep from stem near the soil bag. Then, pull the whole batch out of the soil bag. Clean up any roots remainings out of the soil bag. Where do I store the harvested mushrooms? You should keep our mushrooms in the refrigerator once harvested. How long can I keep the harvested mushrooms? You can keep refrigerated for around 1 week. What can I do with my harvested mushrooms? Cook and eat it! It tastes delicious! My first crop of mushrooms grew beautifully but the second one hasn’t come yet, what’s wrong? It usually takes up to 10-15 days for the second crop to grow. Be patient! Where shall I discard my box after it's done growing mushrooms? Once you are done growing mushroom, retrieve the soil bag in Moku-moku box and use it as compost fertilizer for your garden. How many batches of mushrooms can your box grow? We guarantee the first successful harvest for our products. It can grow up to 1-4 times out of the box. In some cases, it can grow more if you are lucky! Will anything else grow from the mushroom box? Healthy soil will only grow edibles mushroom from Moku-moku box, unless it is contaminated by other type of fungus. Send us some photos if you are not sure. You can join our forum page or facebook page to discuss among other moku users. How do we know whether the soil in Moku-moku box is not healthy? Healthy soil should present in white and light-brown in colour. Typical contamination would show spots and patches of green, black, or other vivid colours. If such contamination occurred, oyster mushrooms would no longer grow from Moku-moku box. Our operation procedure is stringent and staffs follow them strictly to ensure each soil bag that we produce is healthy. Send us some photos of your box if you are not sure. You can join our forum page or facebook page to discuss among other moku users. What happens if my moku-moku box doesn’t grow? We are happy to replace you with another Moku-moku box if it didn’t grow mushroom at all. Please refer to our One-to-One Replacement Policy. What is the optimum condition to grow mushroom? The optimum conditions for growing Oyster Mushroom is Humidity at 80°, temperature at 26-30° at all time. Avoid direct exposure to sun. 1. Like grey oyster mushroom, pink oyster mushroom is in the same Pleurotus family, but it is in pink color. 3. It grows as fast as Grey Oyster Mushroom. Please monitor it daily. 4. Just follow the growing instructions on Grey Oyster Mushroom if you have any doubt. 1. It is also known as Reishi. 2. Be patient, Lingzhi takes up to 2-3 months to be fully grown. While it is growing, you can notice its distinctive white color border. 3. You can harvest it when it is completely in red color. 4. Yes, it is edible. Boiled it with water or cook with soup. Check https://www.youtube.com/watch?v=1GH_uQ7AQlM to make a healthy immortality tea. 5. Don’t be too surprised, the baby Lingzhi is really ugly. Picture shown is a 3 weeks old baby. 1. Black Jelly takes 2-4 weeks to grow and harvest. 2. This is how baby black jelly looks like. They are alien-like creature but completely harmless. What does Moku-moku stand for? Moku has the phonetic sounds like mushroom in Chinese. It is started in June 2013 by two enthusiastic founders, Mervin Low and Sean Chai. They shared the same vision and principle thus creating such amazing product. We only have a variety of Moku-moku boxes as our main product so far. Currently, we have oyster mushrooms, pink oyster mushrooms, Lingzhi mushrooms, abalone mushrooms, and black jelly mushrooms. More to come in the near future. Please follow us on Facebook or subscribe us at mokumoku.my. Can I spread the word about your business & products? All purchases through our website are subject to product availability. We may, in our sole discretion, limit or cancel the quantities offered on our website or limit the sales of our products or services to any person, household, geographic region or urisdiction. Prices for our products are subject to change, without notice. Unless otherwise indicated, prices displayed on our website are quoted in Malaysian Ringgit. We reserve the right, in our sole discretion, to refuse orders, including without limitation, orders that appear to be placed by distributors or resellers. If we believe that you have made a false or fraudulent order, we will be entitled to cancel the order and inform the relevant authorities.We do not guarantee the accuracy of the colour or design of the products on our website. We have made efforts to ensure the colour and design of our products are displayed as accurately as possible on our website. You acknowledge that you are responsible for the information, profiles, opinions, messages, comments and any other content (collectively, the “Content”) that you post, distribute or share on or through our website or services available in connection with our website. You further acknowledge that you have full responsibility for the Content, including but limited to, with respect to its legality, and its trademark, copyright and other intellectual property ownership.You agree that any Content submitted by you in response to a request by us for a specific submission may be edited, adapted, modified, recreated, published, or distributed by us. You further agree that we are under no obligation to maintain any Content in confidence, to pay compensation for any Content or to respond to any Content. You agree that you will not post, distribute or share any Content on our website that is protected by copyright, trademark, patent or any other proprietary right without the express consent of the owner of such proprietary right. You further agree that your Content will not be unlawful, abusive or obscene nor will it contain any malware or computer virus that could affect our website’s operations. You will be solely liable for any Content that you make and its accuracy. We have no responsibility and assume no liability for any Content posted by you or any third-party.We reserve the right to terminate your ability to post on our website and to remove and/or delete any Content that we deem objectionable. You consent to such removal and/or deletion and waive any claim against us for the removal and/or deletion of your Content. The use of our website is at your sole risk and you assume full responsibility for any costs associated with your use of our website. We will not be liable for any damages of any kind related to the use of our website.In no event will we, or our affiliates, our or their respective content or service providers, or any of our or their respective directors, officers, agents, contractors, suppliers or employees be liable to you for any direct, indirect, special, incidental, consequential, exemplary or punitive damages, losses or causes of action, or lost revenue, lost profits, lost business or sales, or any other type of damage, whether based in contract or tort (including negligence), strict liability or otherwise, arising from your use of, or the inability to use, or the performance of, our website or the content or material or functionality through our website, even if we are advised of the possibility of such damages. Certain jurisdictions do not allow limitation of liability or the exclusion or limitation of certain damages. In such jurisdictions, some or all of the above disclaimers, exclusions, or limitations, may not apply to you and our liability will be limited to the maximum extent permitted by law. Please send all questions, comments and feedback to us at ask@mokumoku.my. 1. When will I receive my delivery? Please note that this is not a guaranteed delivery date for your order. Some areas may take longer due to the frequency of deliveries to the delivery postcode. • Order Processing: The amount of time it takes for us to prepare your order for shipping. This typically takes 1 – 2 days. • Delivery Time: The amount of time it takes your order to be picked up by local carrier company from our distribution center and arrive at your place. *Business day mean Monday to Friday, except holidays. Please note we do not ship on Saturdays and Sundays. 2. How many attempts will be made? It all depends on the local carrier company. On failed attempt at delivery, you are require to pick up from thier local distribution center. Examine your order upon delivery to ensure that there are no missing or incorrect pieces. In the event that there are missing, damaged or incorrect packages, please contact us at ask@mokumoku.my within 48 hours of your delivery. For any other problem with your order, please refer to our return policy. PLEASE NOTE that Mokumoku.my will not be responsible for delivery delays due to unforeseen circumstances outside our reasonable control such as delays due to severe weather, natural disasters or strikes. 1. Can I ask for a refund? We do not accept returns or exchange unless the item you purchased is defective. If you receive a defective item, please contact us at ask@mokumoku.my with the details of the product and the defect. We will examine your case and notify you via e-mail, within a reasonable period of time, whether you are entitled to a refund or a replacement as a result of the defect. If you are entitled to a replacement or a refund, we will replace the product or refund the purchase price, using the original method of payment. Please note that in the case of replacement, you do not have to send the item you consider defective back to us. 2. I have made a purchase but would like to cancel it, how? If you have placed an order that you wish to change or cancel, please contact us at ask@mokumoku.my within 12 hours of your purchase. You will receive a full refund for the value of the merchandise only (including applicable tax); shipping and handling will not be refunded. Refund will be made within 90 days from the date of your cancellation, using the original method of payment. Moku-moku will replace a new mushroom box for the same mushroom type inclusive shipping fee if the mushroom box is contaminated upon receiving. Contaminations are usually in the form of green mold patches grows underneath the surface of soil-bed. We will respond to you within 36 hours. Replacement will be given in 100% Discount Code which you can redeem at our store (www.mokumoku.my) at any time. The 100% Discount Code is valid for 2 months upon issued. Redeem it before it gets expired! Moku-moku will replace a new mushroom box for the same mushroom type excluding shipping fee if it does not grow the first crop within 30 days (Product received date is considered the first day) of receiving the product. The expiry date for Moku-moku DIY Mushroom Box is 30 days upon receiving the product. The day of the product received is counted as 1st day. Replacement will be given in 100% Discount Code which you can redeem at our store (www.mokumoku.my) at any time. The 100% Discount Code is valid for 2 months upon issued. Redeem it before it gets expired! 5. One to One Replacement Policy is not valid for the mushroom kit does not follow the growing instructions. One to One replacement Policy is not valid for mushroom kit that does not follow the growing instructions. For example, placing mushroom kit at places that exposed to direct sunlight. Example 2, peeling off the plastic of the soil bag. 6. Each purchase only able to claim once under One to One Replacement Policy. Each purchase is only able to claim one under One to One Replacement Policy. Redeemed mushroom kit is not eligible for One to One Replacement Policy. 8. Moku-moku reserves the right to replace with other items or money with the same value. 9. Moku-moku reserves the right to interpretation of the above terms and conditions. 10. International orders (shipped outside Malaysia) are not eligible for One to One Replacement Policy. International orders (shipped outside Malaysia) normally require 5-15 days for delivery. Please be advised international orders can sometimes be delayed in customs. Be sure to check your shipment tracking number (provided via email when the order ships) for delivery status. *Please Note* - If you are not able to select your country in the shipping field at checkout, this means that we unfortunately do not offer shipping to that country at this time. We apologize for any inconvenience. Orders shipping to destinations outside Malaysia might incur duties and taxes. If duties and taxes are imposed on your order, they are due at time of delivery. Please consult your local customs office for more details about your country's duties and taxes. We are not responsible for any import taxes, duties, or brokerages fees which may be incurred on your international order shipment. We regret that we cannot deliver to international post office boxes. A street address is required for international delivery. By accepting these terms & conditions, you agree that you are not providing a Post Office Box address for your shipment. In the event that your shipment is returned to us as undeliverable due to an international PO Box address, we will not be responsible for refunding shipping costs. International shipping charges vary by the products ordered and the shipping destination. Shipping charges are automatically calculated during the checkout process. We do not collect Sensitive Personal Data from you unless required by applicable laws. If you do not want your Sensitive Personal Data collected by us, please do not submit it. "Sensitive Personal Data" means any personal data consisting of information as to physical or mental health or condition, political opinions, religious beliefs or other beliefs of a similar nature, the commission or alleged commission of an offence or any personal data prescribed under law as sensitive personal data.